Birmingham is a city with a story. Songwriters gather to share craft at The Writers ShareIt makes sense, then, that its residents would be eager to bear witness to the tales of others. Especially if there’s live music involved. A love of song and story inspired Max Berueffy to create The Writer’s Share, a monthly “in the round” showcase of singer/songwriters at the WorkPlay Theatre. You may not know the names of the songwriters themselves, outside of Birmingham artists, but you probably know the stars they write for. Acts such as Alabama, George Strait, Waylon Jennings, Alan Jackson, Solomon Burke and Conway Twitty, to name a few. Sure, it’s fun to see music giants perform their biggest hits. But it’s something else to hear it from the scribes that penned them. “The writers love the format, they love to play in Birmingham, and they love the intimacy of the WorkPlay Theatre,” Berueffy says. The Writer’s Share started, fittingly, in the Songwriting Capital of the World: Nashville, Tenn.
After a chance encounter led to a meeting with one of his favorite singer/songwriters, Marcia Ramirez, Berueffy began laying the groundwork for what would later become The Writer’s Share. Once Berueffy had amassed a roster of songwriters, the first installment of The Writer’s Share went down in September 2013, featuring Bill Whyte, Lisa Shaffer and Steve Dean – the latter of whom penned George Strait’s “Round About Way” and Alabama’s “Southern Star,” among others. 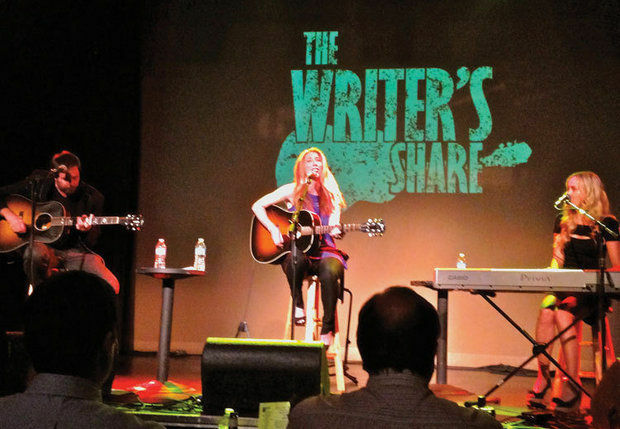 Since then, The Writer’s Share has hosted numerous seasoned songwriters. Most hail from Nashville, but some call Birmingham home – talented locals Taylor Hollingsworth, Kate Taylor and Preston Lovinggood performed together this year – and some, like London’s Izo FitzRoy, are a bit farther out. But The Writer’s Share doesn’t just feature established songwriters. Sometimes they’re right on the precipice of their big break. That’s the beauty of a series like The Writer’s Share – the songs and stories are bigger than the names that created them. Story is king, just as it should be. The future certainly feels bright for The Writer’s Share. WBHM, Birmingham’s public radio station, began sponsoring the series in November, and Berueffy is hoping to bring in singer/songwriters from other parts of the country. Berueffy eventually hopes the series will be available through podcasts or radio as well. One thing that won’t change, however, is the intimacy of the live performances. If you show up early on a weeknight for The Writer’s Share, you’ll bear witness to amazing stories and chart-topping songs – straight from the folks who wrote them.